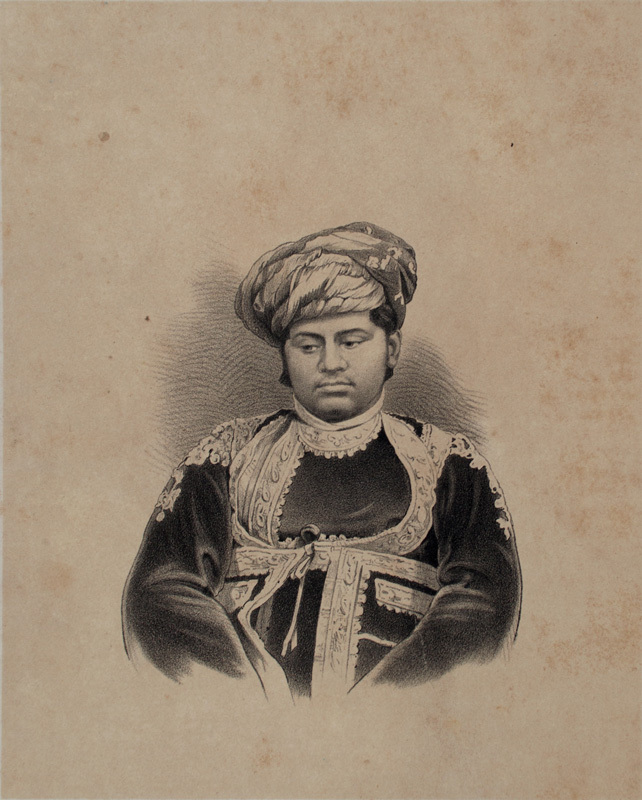 Across the world, photography as a technique developed during this phase and many kings, royalties and noblemen used to print visiting card sized pictures of themselves known as ‘carte de visite’ and ‘carte de cabinet’ (also known as cabinet cards). The main idea behind this was to give them away as gifts. Such cards became enormously popular and were traded among friends and visitors. People started collecting these cards and made albums of famous personalities and celebrities, apart from getting their own portraits printed. These albums also served as a status symbol and were displayed as collector’s items in the homes of aristocrats. But in India photography was still a very expensive medium and not all could afford to have their portraits made. As an alternative tinted lithographs developed and portraits of prominent personalities were printed and sold, in an album format, for people to collect. One of the most known works in this medium was The Portrait Gallery of Western India, by R. H. Jalbhoy, published in 1886, printed at the Education Society’s Press, Byculla, Bombay (according to the British Library copy). It contained 51 tinted lithographic portraits that had text and captions in English and Gujarati. The portraits were published by Vincent Brooks, Day and Son of London and many are based on photographs of the sitters. The work began in 1876 but due to some obstacles the work could only be printed in 1886. Copyright © 2019 Anil Relia • All rights reserved.